This post originally appeared on Transport Providence and is reposted with persmission of the author. I would like to bring a proposal for Rt. 6/10 to your attention. My proposal was #10 on RI NPR’s “Things to Know in Rhode Island” this week, and I hope I can get Council’s attention to discuss it. The Rt. 6/10 Connector would be best redeveloped as a surface boulevard. The RIDOT proposal for bus lanes is what I call “transit oriented decoration” rather than “transit oriented development” because the bus lanes would remain on a raised or sunken highway, which would mean that meaningful transit service would pass over your wards. It’s important to have some kind of “express” service for buses, but what makes buses successful is ridership, which allows frequency. We can only get ridership if we allow the dense neighborhoods that 6/10 passes through to get full service, and that means fostering a healthy pedestrian environment with development around the route. A surface boulevard will do that, and a limited-access highway will not. Bus lanes without a meaningful ridership base and walkable environment will be as unsuccessful as the Wickford Junction Station was, and for the same reasons. I feel urgent about this issue, because highways only get replaced every thirty to fifty years. I will be a very old man if this gets reconsidered in my lifetime. Please join me in asking RIDOT to explore surface boulevard proposals for 6/10. I also sent this letter to Bonnie Nickerson and Bob Azar in the Planning Dept., have contacted the Statehouse Finance Committee, Environmental Committee, Speaker Mattiello, Majority Leader Ruggiero, and Senate President Paiva-Weed. Councilman Bryan Principe of Ward 13 (West End/Federal Hill) has so far contacted me to schedule a meeting to talk. If you are in his ward, please thank him for his interest. You can find who your councilperson is here and contact them. This is a fabulous idea. I feel like it could really help beautify the blighted areas that surround the 6/10. I’m imagining a tree-lined and quaint boulevard with a protected bike lane, multiple bus stops along a protected bus lane. James, thanks for all the energy you are putting into getting attention to this, especially from the Providence City Council and Planning Departments (Mayor’s Office?) that will be a major part of the decision process. Further follow up for all interested: lets bring this up to RIPTA planners and Board members, maybe at their next meeting (normally 1:30pm on third Mondays presumably June 15) where public comment is welcome and early on the agenda. They should be sympathetic as a bus lane on the expressway may sop up a lot of Federal Transit funds without doing much good. Another venue to call attention to the idea of a boulevard is at the Transportation Advisory Committee which also allows public comment, they meet 6:30pm on 4th Thursdays, presumably on June 25. But the main decision makers will be the Governor and her RIDOT team. At a conference call with transportation advocates they certainly indicated they were both open to all ideas, and to being sensitive to abutting 6/10 neighborhoods. Finally, perhaps a walk around the abutting streets could be organized, inviting Olneyville and Federal Hill interests to participate, so we all see the opportunities and challenges and share ideas on-site. This idea has been formally endorsed by UNITE-HERE 217, which has 1300 members. I’ve been working to make the point that this is cheaper to conservative groups as well. I hope that this will become a point of cross-party consensus. Really happy to report that this is getting bipartisan interest. House Minority Leader Brian Newberry asked a pointed question of Director Alviti: Can we take out Rt. 6 and 10 since they’ve done so much harm to Olneyville? Director Alviti said all options are on the table. This is something I had day dreamed about but never thought it would be actually feasible, would be really inspiring to have that pessimism crushed because this is really a great idea. Never too late to heal an old wound I guess! This proposal is refreshing. However, one issue of concern (in terms of designing the new surface boulevard) is that there are surface-level train tracks running directly parallel to the entire span of route 10. This is problematic for reconnecting the urban fabric between the West End and Olneyville at ground level, unless of course the tracks will be moved -which is an unlikely and expensive project. If the tracks remain as they are now, it will be difficult to make this area “walkable” if the area only consists of minimal development (if any), a road (highway or boulevard), and overpasses that link the two neighborhoods. Not sure how this would affect public transit ridership too. The “surface level” of the route 6/10 corridor was largely excavated during the creation of the highway. Before this, most of the major streets were once at surface level. 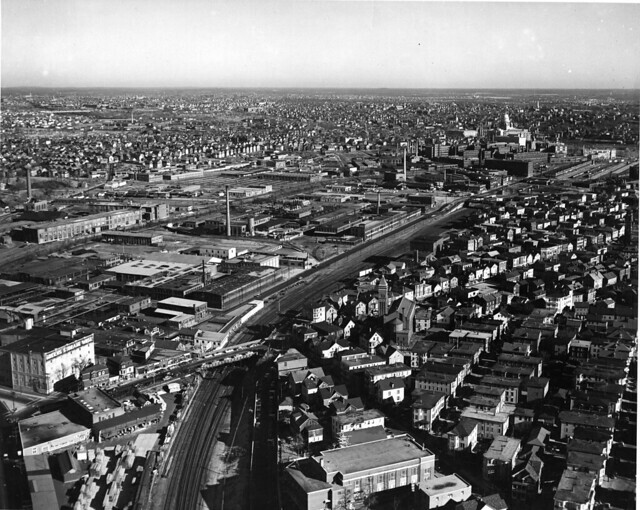 The highway excavation created a steep cliff around Federal Hill which necessitated bridges to connect streets like Broadway and Westminister to Olnyville. 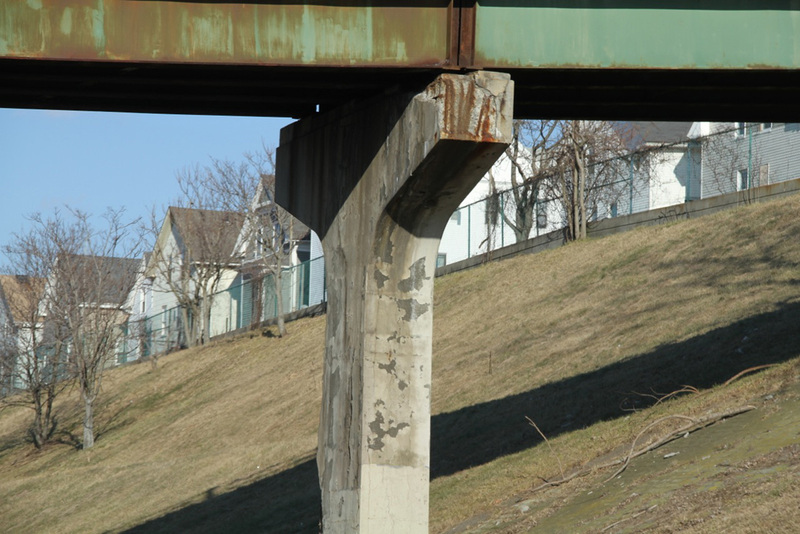 Removing the highway could allow for most of those bridges over route 6/10 to be replaced by raised earth. That would leave only the small bridge spans over Amtrak’s North East Corridor. I’d like to imagine it’s fairly easy to get federal funding to replace failing bridges over Amtrak’s important north east corridor. I think the issue with this project is re-grading the canyon left by the removal of route 6/10. Otherwise we’re still looking at many state funded expensive bridges. Perhaps this project could coincide with the dredging of the Providence River and reclaimed silt and soil could be used and earth fill, but that’s just fantasy. Liam, I think that is the biggest design challenge. For it to be “surface level” from Westminster to Dean St, it would need to be at federal hill’s surface level. Compare pre-highway eagle square: http://farm8.static.flickr.com/7167/6720872753_e8fc39ffd6_z.jpg to current-day: http://binged.it/1G0dbpn . Use the church as a point of reference. There’s a fair amount of land to work with if the hill is rebuilt. I wonder how expensive that would be, though. There would be much more straightforward gains in the western part of olneyville, which could have a surface-level boulevard that’s not between a hill and train tracks: http://binged.it/1KJY3xx . If a 6/10 boulevard were regraded, there would likely be a drop-off or retaining wall adjacent to the Amtrak right-of-way. Where new development or urban infill could happen is along the Federal Hill side of a new 6/10 boulevard. The section between Broadway, the Tobey Street Bridge and just south of Atwells has a depth of100-feet+/-,which is generally the depth of a house lot. This segment is roughly 4.5-acres, New infill along this area could be more characteristic of traditional Federal Hill scale. 35 to 40 new lots could be created, which could mirror Ridge Street’s typical 3-story building heights. Alternately a series of row houses could be built or slightly taller low-rise buildings. Large-scale development would be more appropriate in the triangular shaped section north of Atwells to the Dean Street ramps, as the distance between the 6/10 and Spruce Street fans out from 100 to 500-feet or about 8-acres of land area. Both a new boulevard and Dean Street would have wide street widths, which could accommodate larger buildings. The approximate 12.5-acres next to the 6/10 right-of-way is similar to the developable area (non-park or non-ball park) of the 195-land west of the river, which is about 13-acres. Whether it’s a new boulevard or a simple replacement of the highway, the state and city needs to reserve a minimum of a 4-track right-of-way for Amtrak. For a future Olneyville train station, whether it’s to be located adjacent to Harris Avenue as from the most recent proposal, or if the station were shifted between Broadway and just south of Westminster, a similar right-of-way width to the Pawtucket/Central Falls train station proposal of 5-tracks with two12-foot wide platforms should be reserved. Peter makes some good points and is right to cal attention to the potential of infill commuter rail sations such as in Olneyville. I recommedn looking at http://www.cityofrochester.gov and look at what Rochester, NY is actually planning to do in removing an expressway around central Rochester that is hurting the city by disconnecting the center from surrounding neighborhoods. While every situation is different, Rochester is surely a comparable city to Providence. Raised earth sounds like a good proposal, although I must admit that I had imagined the kind of carved-earth, tree-lined hills that either side of the Cranston bike path has, to give the whole thinga feeling like a shaded forest area. Arman’s propsal is probablymore practical though. I’d like. to see the car lanes go down to just two on route 10, but have a wide bike path and two bus lanes. Keeping a 6/10 “boulevard” at grade level would simply recreate the highway and not connect to the adjacent neighborhoods. It would have to be raised up. Cost-wise, I doubt there would be much savings; you would simply be trading the cost of a new viaduct with the cost of backfill, new bridges over Amtrak, and extension of the project limits by a mile or so toward downtown. The end of Dike Street looks like a good location for an Olneyville station. Historically, there were stations at Atwells, Westminster, and Dike; the actual “Olneyville” station was on the Pascoag branch, roughly where Route 6 crosses Plainfield Street today. I’d like to see no more than two lanes of car traffic on the boulevard (but two for buses or additional rail, and a bike path). So my vision for the amount of car traffic coming through is different than what currently exists. A lot of cars can be moved on two lanes, especially if the transit and bike component is thought-out well. Many more people could be moving through this corridor that currently do, but with fewer cars. My Dad was an engineer on the Olneyville Expressway construction project over 60 years ago, but it will be good to see it gone!